The United States Congress designated the Lacassine Wilderness (map) in 1976 and it now has a total of 3,346 acres (3345.6 acres, technically). All of this wilderness is located in Louisiana and is managed by the Fish and Wildlife Service. 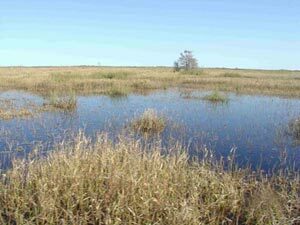 On the southern end of the Mississippi and Central Flyways, Lacassine Wilderness is primarily a freshwater marsh. Lacassine refuge marshes provide feeding and resting habitat for more than 300,000 ducks and 80,000 geese. The refuge also provides habitat for many shorebirds, wading birds, marsh birds, various mammals, and alligators. The first nesting colony of cattle egrets outside Florida was discovered here. Nesting rookeries of roseate spoonbills, and other wading birds can be found in the Lacassine Pool. Watch for armadillos, swamp rabbits, minks, otters, nutrias and American alligators. The southern portion of the refuge, south of the pipeline canal and west of Bayou Misere, has been designated Wilderness. Unlike the rest of the refuge, this area has seen relatively little impact from human activity. There are no established trails, and no camping is allowed. The Wilderness area can be accessed by non-motorized vessel or chest waders. The name Lacassine comes from the local Native American word "loc o'shin", which means "at the prairies edge". Planning to Visit the Lacassine Wilderness? How to follow the seven standard Leave No Trace principles differs in different parts of the country (desert vs. Rocky Mountains). Click on any of the principles listed below to learn more about how they apply in the Lacassine Wilderness.